The 9 Best Educational Activities for Children in North Dakota! Who says learning must stop when school is out? 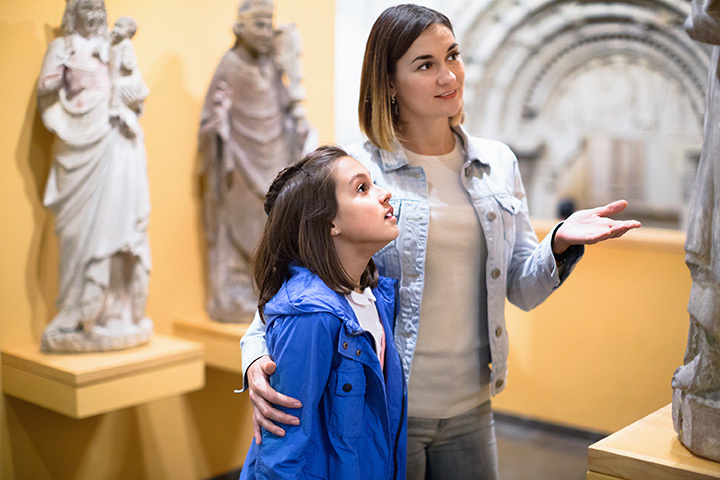 North Dakota is home to a wide variety of educational activities that range from museums and historical sites to centers designed to inspire, engage, and enhance. If you are looking for an activity that can captivate the entire family, look no further than these nine great spots. With interactive exhibits that include the “Adaptation Gallery: Geologic Time,” the “Innovation Gallery: Early Peoples,” the “Inspiration Gallery: Yesterday and Today,” and the “Governors Gallery: Green Revolution,” the museum has a plethora of exciting opportunities to learn more about the state and its rich history. Children will likely to be most drawn, however, to the life-sized casts of a Tyrannosaurus rex and a Triceratops engaged in battle. Nowhere else can you get a first-hand look at what life was like in the 1800s. Step inside an authentic blacksmith shop, cozy up to the bar at the Brass Rail Saloon, try to imagine a typical day at the Dobrinz School, or stroll through the Law Enforcement Museum. Few activities will make children more grateful for the contemporary luxuries that are so easy to take for granted. With a plethora of interactive exhibits that explore the many roles science plays in our everyday lives, children of all ages will be enthralled for hours. North Dakota’s only science center, Gateway has been inspiring young minds since 1994. The center’s most popular exhibits include a robotic arm, simple machines, and electricity and magnetism. A trip aboard the Lewis & Clark Riverboat will provide you and your children with an incomparable and authentic North Dakota experience. Part of the Fort Abraham Lincoln Foundation, the riverboat will take your family on a beautiful one to two-hour cruise down the serene waters of the Missouri River. North Dakota’s only botanical garden is home to a butterfly garden, rain garden, hummingbird patio, and alphabet garden, within which each of the mini-gardens are designated by a specific letter of the alphabet. It is a perfect place for budding horticulturists to get their proverbial feet wet. Located within the Dakota Territory Air Museum, the Magic City Discovery Center is Minot’s only children’s museum. Fun and entertaining opportunities include educational games, science related exhibits, play areas, a magnetic wall, and a gigantic light bright. Located on four acres of land in NW Mandan, the museum includes a wide variety of railroad related equipment, include a bridge, speeder shacks, a coaling bucket, tracks, and of course, train cars. The museum also includes a vast collection of literature and memorabilia. Plan to spend a good amount of time on the grounds—there is a lot to take in. Located within a house originally built in 1876, Yunker Farm is a virtual treasure-trove of interactive educational activity. On any given day, children can enjoy one of over 50 different exhibits, games, and activities. Special events are also held on the grounds on a regular basis. The Buffalo Museum’s exhibits focus on the history of the buffalo and the Plains Indians that were the original residents of the area. With a mix of artwork and artifacts, the museum tells the tale of life in the 19th century. The grounds are also home to the “World’s Largest Buffalo,” one of the best photo opportunities in the state.